Sand Hill Review Press, 9781937818005, 274pp. On November 23, 2000, one hundred inmates hold twelve guards hostage in the laundry dorm of The Indiana Penal Farm. Emergency squads are massed along the fence, awaiting the order to attack, while sharpshooters are perched like crows on top of the administration building. Tom Hemmings, a dorm counselor, has been conscripted to defuse the standoff. But the inmates are divided into rival gangs, the guards into feuding unions. And the prison administration has sparked the standoff by forcing cut-rate services upon the facility. As he enters the prison, Tom's heart starts to hammer. Who are the good guys? Who are the bad? And how will this nightmare end? James Hanna wandered Australia for seven years before settling on a career in criminal justice. He spent 20 years as a counselor in the Indiana Department of Corrections and is a probation officer in San Francisco where he is assigned to a domestic violence and stalking unit. James' short stories have appeared in Old Crow Review, Sandhills Review, Edge City Review, Eclipse, Fault Zone, The California Writers Club Literary Review, Red Savina Review, The Literary Review and the Sand Hill Review. Two of his stories were nominated for the Pushcart Prize. 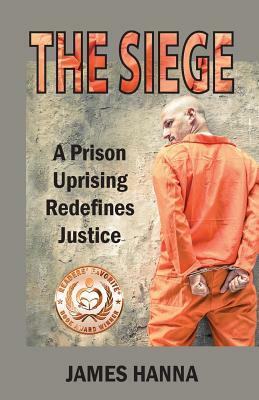 The Siege is James' first published novel.